Having a pet cat at home would require you several pet products and accessories. Some of it may be importantly close to being a necessity and some would just be for additional comfort. It is safe to say that the cat scratcher, cat house and the best cat litter box would be one of the necessary things at home for cats. But it's not really just about that. For cat litter boxes, you need to place it somewhere private where cats would consider using it or won't be disturbed by other pets you have at home. Additional to that, you would want it somewhere where the odor wouldn't be smelled as it is very unpleasant that you have it around the house. Fortunately, there is the best cat litter box enclosure that you can avail to hide and cover your cat's litter box and keep the odor controlled. Some cats would prefer to go outside and do their thing, searching for dirt they can dug up. However, indoor cat pets and most cat lovers would not prefer cats to go out. It can be dangerous for your cats to be outside the house. They are prone to accidents and predators. Some just won't give a chance to their cat getting their garden destroyed by their pet. Regardless of which, the best option would be to get them a cat litter box. The main problem cat owners often just see about cat litter boxes is how to control the odor. In that regards, cat litter box enclosure works as additional furniture where you can place the litter box inside. It is to give your cat the privacy they need. It also allows you to place the litter box in most places of the house as it is entirely discreet, secure and private and most importantly, keeps the wastes odor from spreading all over the area of the house. The furniture may just be an add-on but it could bring comfort and sanitation at a little expense. Cat Litter Box Enclosure F.A.Q. How large is a cat litter box enclosure? How many cats can use the enclosure? Does it have other purpose apart from enclosing a litter box? Are you required to have one at home for your cats? Can it reduce the odor from your cat's litter box? 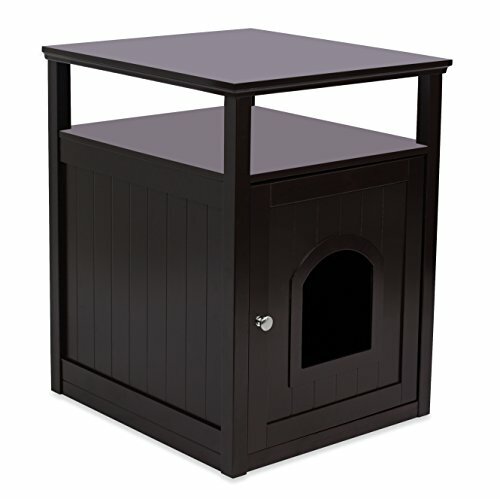 First choice of being the best cat litter box enclosure is the odorless night stand from Petsfit. It is classy, elegant looking cat furniture with an espresso color. It also comes in white color depending on your choice. This box or enclosure helps minimize or closely eliminates unpleasant odor from your litter boxes. It keeps it safe, secure, private and from an unpleasant view. This enclosure will also give you a chance to put your litter box anywhere in the house without consuming a lot of space and perfectly hides itself as part of your home's furniture. You'd barely notice that it is an enclosure. The cat enclosure's design perfectly fits any home design, decoration and furniture. It highly controls the odor to a minimum. The enclosure saves you a great deal of effort in looking for an ideal place to put your litter box. It is very easy to assemble. Made from strong and quality wood that can tolerate cat behaviors. It does not naturally attract cats. Using an enclosure would require your cat to be trained. The enclosure can only enclose 1 litter box which means it can't accommodate multiple cats. Next pick is from Internet's Best. This is a decorative litter box enclosure with a side table and shelf. The main purpose of this is to enclose a cat's litter box but the multi-functional design also allows it to be perfect home furniture. The top shelf can be used for organizing accessories. The table can be used to stand your books, vase, figurines and more. In any of that, it can also be used as a cat home nightstand. This is perfect going along with any home interior design and furniture. You have 2 designs to choose from, white and espresso. It uses a hinged door for the litter box and has a hole in the middle for cat entry. It has a wood stained design that provides luxurious appearance and elegance. The enclosure features a spacious table top and a middle shelf for other things such as magazines, plant pots, vases, lamps, etc. The box is fairly wide. It has an overall dimension of 18.9 inches wide, 24.8 inches in height and 20.5 inches in depth. It looks very classy for cat furniture. The multi-functional design saves space, money and effort. 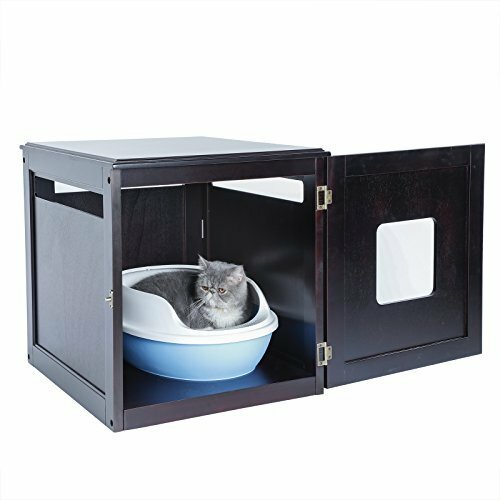 The hinged door provides privacy to your cats and controls the odor. It has an organizational feature, table top and shelf. It's a little wide. The box may not fit small home and dorm rooms. There are times that a cat might not want to use the box, especially when the room gets crowded. This is also a great choice from Internet's Best. 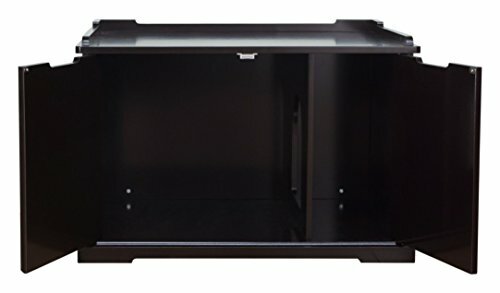 The enclosure features the same type of design but without the top table and the shelf. It allows you the option to purchase a litter box enclosure without some of its previous features, saving you some amount of expenses. It is more like an affordable version of the original design of the litter box enclosure. However, with the absent of the shelf and the top table, the design can still provide a top space for some of your things such as flower pot, vase, magazines and more. It could also be a good spot for your cat to lounge around. You'd still get almost the same feature with the original design without the shelf at an affordable price. Cats could easily get in and get out of the fixed hole. The hinge works perfect for keeping the odor controlled as well as for cleaning and maintenance. The wide space on top of the box can serve other purpose such as space for other home things or cat lounging area. Without the shelf, it just looks like an ordinary box. This enclosure can only be good for single cats at home. It can't cater to the needs of multiple cats. This is the Pet house and litter box enclosure from Trixie Pet Products. The manufacturer is known to create many pet products and accessories that are highly helpful and beneficial to your pets at home. This right here is an elegant looking litter box but could also be used as a pet house depending on your choice. The box features a partition on the right corner of the interior area that has a hole in the middle. The smaller area of the partition is ideally where your litter box would be placed and the large area would be your cat's pet house. You can choose between double design, double decker or a single cat litter box enclosure, each design has varying prices. The elegant design is perfect for hiding cat litter boxes. It is very spacious and provides home with privacy for your cats. 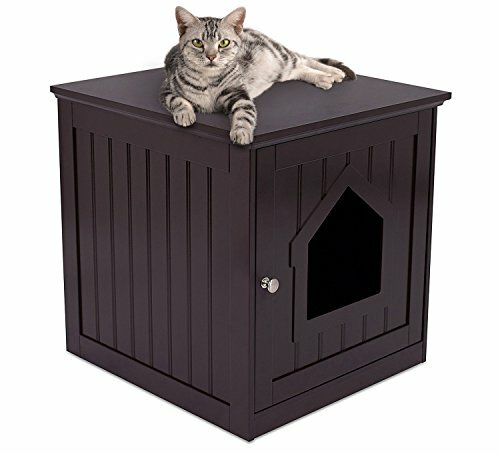 The cat box enclosure is made from strong and durable wood which could stand cat scratching and other excessive behaviors. It's very wide and spacious. It can actually be a home for 2 cats. The table top or the top part of the box can be used for many purposes. You can even choose to sit on top of it provided you weigh average. It is discrete and barely noticeable. The elegant design actually mimics your actual home furniture. This is not ideal for small home room or dorm rooms. It consumes a lot of floor space. The litter box enclosure if a little bit expensive for just being cat furniture. 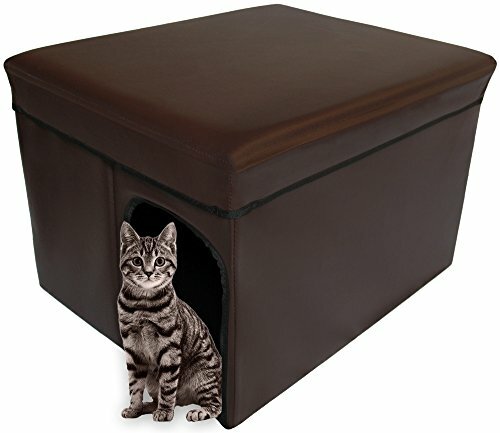 Last on our picks of the best cat litter box enclosure is the Pet House Hidden Enclosure from Ottoman. The enclosure features leather coated furniture that could work both as a couch and as a litter box enclosure. It can also be used as a play area or cat house. The exterior leather cover is great for lounging cats. It's very comfortable and keeps them warm during cold weather. The enclosure works great with other furniture relative to aesthetics. The enclosure is made from wood, leather, rubber and more. All of which are high quality and durable. The leather covered part is cushioned, making it comfortable for cats. It has a removable top so you could place or remove the litter box. You can choose to use it as a cat house by not placing a litter box inside. It has a hole on one side where your cat can pass through without problems. The unique leather design really makes a difference when providing comfort and insulation. Removable top makes it easier for you to convert the enclosure to a cat house or litter box enclosure. It's very affordable. The materials used are durable and long lasting. This box can survive cat's behavior, specifically scratching and pawing. Light weight design. It might not fit or will not provide enough space for large cats. Unlike other cat litter box enclosure, you can't use the top space as a shelf or a table top for other things. There are some important things you need to understand in order for you to have a good cat litter box enclosure for your cats. These things are called key features that a product has in order to determine its quality in accordance with your purpose. It is more like characteristics that they need to have to fit the standards of a good and viable product. Referring to the best cat litter box enclosure, what we need to look for is the materials used, how it was built, its size and dimension, accessibility and functionality. Having all of these key features or at least half of them will help you know if the product is worth every penny you spent. This is the most important key feature to check when you're looking for the best litter box enclosure. Cats can sometimes get rough. They have lots of natural behaviors that could easily damage home furniture, especially the ones with leather and fabric. The one thing that would concern you more is the excessive scratching. That's why other pet owners look for the best cat scratchers along with their litter box enclosure. Cheap and non-quality materials would get easily destroyed and torn apart by cat's paws and claws. It might withstand the excessive behavior once or twice but it can only hold as much stress. Make sure you check the type of materials used from wood, rubber, nails, fabric, leather and more. Another thing to look for is the construction. It refers more on how it was built. There are some products that are made from good and quality materials but do not seem to be strong and sturdy. The best cat litter box enclosure should always be strong, sturdy and stable. It basically houses a cat and some of the box enclosures have shelves and table top where you're putting other things like flower pots, vases, magazines, books and more. A lousy construction will just waste good quality materials as it would easily collapse when weight starts to build up. Not to mention that a cat playing with it or lounging above or inside it adds more stress to the furniture. Next key feature would be the product's size or dimension. Cat litter box enclosure is considered to be one of your home furniture but specifically built for cats. It is best to know how large a space it would consume. 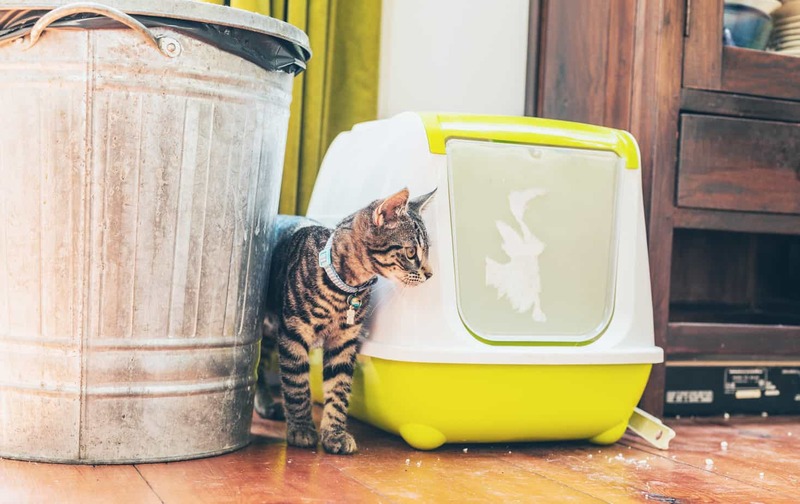 Your home or dorm room might not be big enough to get your cat a litter box enclosure nor does your living room have some space to have additional furniture. It would be very unfortunate if you bought an enclosure and end up not using it as there is no space available to place it. Always make it a habit to check the product's size and vary it to the floor area you have in your home. Accessibility means how your cat can access the box, getting through and out of the enclosure. It also refers to how you can easily you can access the interior part of the box for placing the litter box, cleaning and maintenance. There is some litter box enclosure that does not provide a good accessibility such as closing and opening hinged doors or removable top. It might be hard to clean if the entry and exit is fixed or narrow. Litter box enclosure does not come cheap. It may be affordable but there are some products with great quality but would be a little expensive. Regardless, a litter box enclosure is a furniture where you'd at least expect it to have other functions that just keeping your cat's litter box secured and in a private place. Look for a product that could serve other purpose like housing a cat, provide lounging, and offer shelf or a table top where you can place other things such as flowers pots, books, magazines and more. The average size of a cat litter box enclosure is about 18 inches in length. Regardless of the height and deep, the length size would help you determine the floor area that the enclosure will consume. You can tell depending on perspective whether or not 18 inches length furniture is large enough or too small. However, for small bed, living and dorm rooms, it's a perfect fit or in some cases, maybe too large. Have a general idea of how spacious the area you are planning to place the cat furniture and vary the floor area to the standard or average size of the enclosure. Normally, it would be able to cater one cat. That's not because of its size. It can certainly fit at least 2 cats. However, cats may not want to interfere with each other’s business nor would want to use something that the other cat might use. They want to keep things private or to their selves. That's why most litter boxes are in the area where no one is watching or does not have a lot of noise or inaccessible to other pets at home. A litter box enclosure might be able to serve several cats but that depends on the nature of the cat or on how you train them to do their potty. There are products with specific purpose, limited only to enclosing a cat litter box. However, it may not seem to be considered as the best cat litter box enclosure. It is possibly due to the fact that an enclosure usually takes up at least 18 inches of floor area in length. You might want to have some purpose for it apart from just being an enclosure as the furniture consumes a wide amount of space. It’s not at all required. Litter box enclosure is fairly optional. If you can stand watching an unpleasant view of what's in the litter box every morning or does not mind the foul odor from your cat's early morning potty, then it really doesn't matter. However, if you plan on keeping things more pleasant in your home to see and smell, then a cat litter box enclosure could really make a difference. Yes it can. It will greatly help in reducing the odor compared to a litter box without an enclosure. It conceals the smell of your cat's early morning or late afternoon potty. Apart from concealing odor, it also helps in concealing an unpleasant view. You can easily spray the litter box with odor removing sprays or air fresheners if it further pleases you. In conclusion, a cat litter box enclosure is actually a great investment for you and your cat. It will give you both some benefits and reducing your effort spent in keeping things clean and pleasant. It is actually one of the best cat gifts you can buy for your pet. The enclosure discreetly hides the litter box and is hard to tell whether or not it is normal home furniture due to most of its design and style. You'd also have fewer problems making it fit to your home's interior decoration as it looks closely like home furniture.